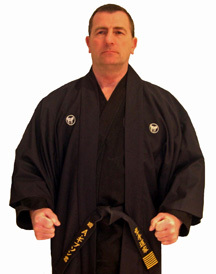 Hanshi Alan Gibson is one of Britains highest graded black belts. With over 57 years of training and teaching in different styles of karate and other martial arts with some of the worlds top masters he is also regarded as one of the most experienced karate teachers in Britain today. Commended on local & national television for his karate skills and power as seen on "South today" "Meridian News" "Channel 4s Big Breakfast" and BBC's "That's Life", awarded Sussex County's top bravery award by the Head of Sussex fire service and presented by the Lord Mayor of Brighton for his courageous actions in saving the lives of a mother and her three children from a house fire. The only karate exponent to be awarded the supreme medal of courage from the I.O.F. (world leaders against child abuse) from their headquarters in Toronto, Canada, and nominated for "Hearts of Gold award" and the Queen's award for bravery. CLICK HERE Read more about Hanshi's karate history.